Giant freshwater stingray measuring 202cm across the disk and 413cm from nose-tip to tail-end. The giant freshwater stingray is one of the largest and heaviest freshwater fishes in the world. Only described by scientists in 1990, the giant freshwater stingray occurs in several river systems in Southeast Asia and northern Australia. 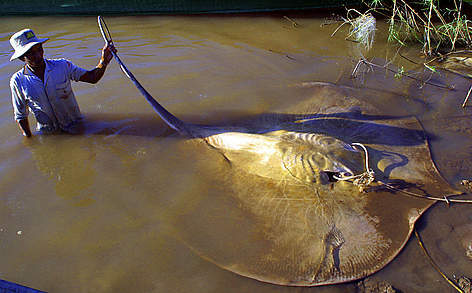 While Australian populations – which generally average much smaller than those in Southeast Asia – appear to be stable, giant freshwater stingrays have been under serious decline in Thailand, where they are now listed as critically endangered. In Cambodia, not much is known about this species’ status in the Mekong River, and more research is needed to develop an effective species management plan. As a benthic feeder foraging on the river bottom, these stingrays are especially vulnerable to increasing siltation due to human activity as well as to isolation of reproductive subpopulations through construction of large-scale hydropower dams.